HomeMetallic Paper: A Power Source for Flexible Wearables? Devices that can be safely bent out of shape, form curves or even fold up could be the next big thing in electronics. These devices are most likely to take the shape of ergonomic wearables that may even be expected to adhere to and remain on the skin for prolonged periods. Besides this putative trend in health and fitness trackers, there are increasingly credible online rumours that Samsung is working on its first flexible-display phone. Obviously, these futuristic accessories will not be possible using traditional batteries, which need to take the form of solid blocks of well-shielded compounds for obvious reasons. Therefore, unless people are willing to keep large, heavy power packs with wires leading to their new second-skin-like devices on them at all times, batteries are going to have to form thinner, more flexible layers for integration into these new form factors. Flexible batteries do exist, albeit mostly in Research and Development labs and industrial concepts or prototypes. However, they are still lagging behind traditional lithium-ion battery packs in terms of energy density and power, meaning the charge they can store and deliver in terms of their surface area. A new form of flexible energy storage vehicle, developed as a result of collaboration across Korean and U.S. institutions, has been shown to rival lithium-based batteries with respect to these specifications. This new proposed energy-storage standard is particularly interesting because it contains a nanoparticle-based supercapacitor, and uses paper as a substrate for this material. Therefore, it should be very flexible and could be easily manufactured and shaped to fit many wearable or other device types. Flexible batteries tend to be based on different types of super-capacitors (SCs) rather than lithium-ion technology. They also tend to have a higher power density than the traditional material, as well as charging up faster and having improved life-cycles compared to lithium-ion batteries. However, a disadvantage is that they may also discharge faster than conventional batteries. SCs also tend to exhibit relatively low energy densities (about five watt-hours per kilogram (or Wh/kg)) whereas lithium-ion technology can be expected to deliver about thirty times this value. In addition, many researchers assert that flexible SC-based batteries need to improve on their capacitance and power over a given area. SCs are often metallic such as gold, which may be combined with nano-polymers that improve their capacitance, flexibility or both. Additional substances that improve capacitance are known as pseudo-capacitors (PCs), and may become important components of flexible batteries in the future. Finally, flexible batteries need a ‘bottom layer’ that may be conductive, porous (so as to enhance the deposition of the supercapactive and pseudocapacitive nanoparticles) or both, and are also extremely flexible themselves. Cellulose-based paper is often chosen as this substrate, because it tends to have both these properties, and is also cheap and easy to source. The team of researchers working at Korea University’s Department of Chemical and Biological Engineering and the G.W. 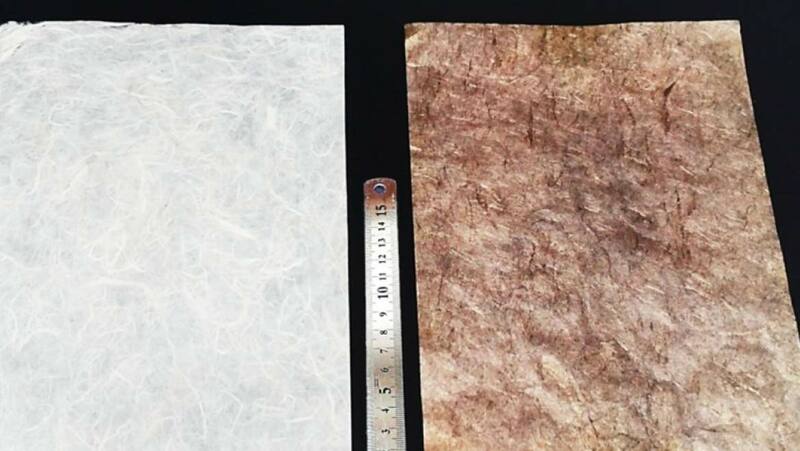 Woodruff School of Mechanical Engineering in the Georgia Institute of Technology at Atlanta chose a commercial-grade form of cellulose paper, known as ‘Hanji’ in Korea, as the substrate for their proposed supercapacitor-based battery. The team then added tris(2-aminoethyl) amine (TREN)-linked gold nanoparticles as a layer on top of this paper. Next, the team added a further layer of manganese oxide or Fe3O4 nanoparticles, stabilised with oleic acid, as these compounds have been found to be effective PCs. The results, which the team refer to as ‘metallised paper’ was produced using a manufacturing technique called layer-by-layer deposition. This technique is relatively simple to execute, which should conserve costs, but is historically linked to some drawbacks when used to produce SC-based flexible energy storage units. These have included uneven nanoparticle distribution due to undesirable interactions between similarly-charged molecules; the formation of voids within porous substrates due to large polymer subunits and increased resistance among nanoparticles. Despite these drawbacks, the team behind this project reported favourable results associated with the performance of their new layered flexible supercapacitor. This may have been due to the materials chosen: the TREN linkers between the layers of gold particles were only one molecule thick, and have a relatively low molecular weight. Therefore, the management of resistance within the nanoparticle layers may have been managed with improved efficiency in this example of a paper battery. This translated to about 0.3 ohms of sheet resistance (or ohms across a given two-dimensional area, typically abbreviated to ‘sq’) in the team’s paper supercapacitor, which was compared to the value of 90 ohms/sq generated by a more conventional linking polymer. In addition, the new battery was reported to exhibit an energy density of 267.3 μWh/cm2 or about 121.5 Wh/kg, while the maximum power was reported at 15.1 mW/cm2. The team, writing in their paper describing this new energy-storage device, published in the September issue of Nature Communications, concluded that these values compete well with those of typical lithium-ion batteries. The paper battery also exhibited the ability to retain approximately 90 percent of its charging capacity after undergoing 5,000 charging cycles. If this team, led by Seung Woo Lee & Jinhan Cho of the G.W. Woodruff School and the Korean Department of Chemical and Biological Engineering respectively, are to be believed, the future of battery technology lies in layers of PCs and SCs arranged strategically so as to enhance their energy density, maximum power and general capacitance; and also to limit their sheet resistance and nanoparticle migration based on incompatible charge states. These layers, in combination with optimal substrates such as cellulose paper, may be the basis of devices that are flexible in physical and electrochemical terms. The thin-layer constructions that result from this project should be amenable and cost-effective in a mass-production context. On the other hand, they do incorporate gold nanoparticles, which may be more expensive than a conventional material such as lithium. However, the advantages of evolving away from the traditional solid battery block to more flexible form factors may outweigh this additional cost. In general, this project adds momentum to the migration towards fully flexible, functional batteries. Ko Y, Kwon M, Bae WK, Lee B, Lee SW, Cho J. (2017) Flexible supercapacitor electrodes based on real metal-like cellulose papers. Nature Communications. 8:(1). pp.536.